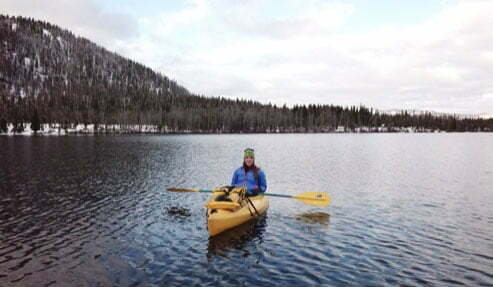 There are so many incredible outdoor opportunities in Central Idaho, and it can be a daunting task choosing what to do during your trip. You don’t want to miss out on any of the once-in-a-lifetime adventures that await you in the Sawtooths, but you also don’t want to burn out all of your energy by cramming too many activities into your itinerary. But who says you can’t have an adventure while relaxing at the same time? You can do just that at the Kirkham Hot Springs, where scenic mountain views and relaxing warm waters mix for the perfect intro to Central Idaho. If you want to find a complete list of the top things to do and see in the area, request our free Adventure Guide! What is Kirkham Hot Springs? Kirkham Hot Springs is a network of naturally heated pools along the scenic Payette River. This gorgeous location is a fantastic spot to start your adventure in Central Idaho! Unlike most hot springs, these undeveloped pools give guests the chance to experience untouched nature at its finest. There are a few small, steaming waterfalls that pour onto the rocks around the hot springs, adding to the already one-of-a-kind outdoor atmosphere. You can sit in the tranquil pools as you listen to the sounds of rushing water from the river and take in the awe-inspiring views of the mountains near Boise National Forest. Why should you visit the Kirkham Hot Springs? The answer is simple. The naturally heated water combined with the views makes for a unique experience. There are few hot springs located in Central Idaho accessible via car that boast the same level of quality natural pools. Highway 21 runs parallel with the Payette River, but the Kirkham Hot Springs sits down next to the riverbed so you can’t tell that the road is nearby. This is a fantastic place to stop on your way to or from Boise during your trip to Stanley. It’s very popular during the summer and winter seasons, so you can expect a decent crowd if you choose to stop here. The site has a $5 parking fee and is open from 6 a.m. to 10 p.m. The Kirkham Hot Springs is easy to access year-round. It sits along Highway 21 about an hour and fifty minutes from the Boise Airport and one hour from Stanley. We recommend Kirkham Hot Springs as a fun introduction to your Central Idaho adventure! Take a quick soak in the pools before hopping back in your car and finishing the last leg of your trip to Triangle C Cabins! Get ready for a vacation like you never imagined! Stay at Triangle C Cabins! Triangle C Cabins is the perfect place to call home during your Central Idaho adventure! 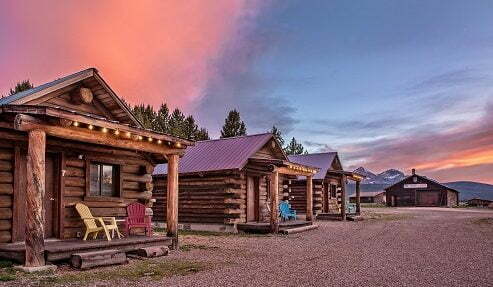 Disconnect from the hustle and bustle of the rest of the world and enjoy peaceful nights in your authentic cabin, explore the Sawtooth Wilderness, and soak in the breathtaking views on the shores of nearby Redfish Lake. Add on one of our Adventure Bundles for a unique outdoor experience! Ready to book your cabin with us? If you can’t find any availability, take a look at Redfish Lake Lodge, Stanley High Country Inn, and Redfish Riverside Lodge for other fantastic Stanley lodging options! We look forward to welcoming you to our mountain oasis!